At the core of the recent National Academy of Public Administration report titled Strengthening Organizational Health and Performance in Government was the need to create an environment where federal managers are encouraged to use data to better understand their organizational challenges. At a time when many federal agencies are faced with hiring freezes and an inability to fill behind those who leave, managers might benefit from using Federal Employee Viewpoint Survey (FEVS) data to figure out if there are issues within their control that might help to retain valued staff. Losing talented employees can affect an agency’s ability to performance its mission, not to mention the emotional and workload impact on those staff left behind. Attrition can severely influence an organization’s capability and health. Several years ago, the Partnership for Public Service issued a study that focused on helping agencies understand why people stay and why people leave. Beneath the Surface: Understanding Attrition at Your Agency and Why It Matters set forth the idea that looking at certain questions in the FEVS could provide attrition/retention clues worth investigating. 5 percent said “yes” but for other reasons. However, this question doesn’t tell a manager if a person will actually leave and it also doesn’t tell the manager the quality or performance of the individual responding but when one looks at the responses to questions based on whether an employee says they plan to leave or stay, it can show areas that might need to be more closely studied. The Partnership compared the answers to selected questions based on whether a respondent said they planned to leave or stay and saw gaps in the percentage of positive responses that were telling (see figure 1). For example, those who said they planned to stay with their organization within the next year were much more likely to agree with the statement, “My talents are used well in the workplace,” than those who say they are planning to leave. Those who say they are staying also are considerably more likely to agree with the idea that their “work gives [them] a feeling of accomplishment.” Those who plan to leave were less likely to be satisfied with the recognition they receive and less likely to say they like the work they do. If valued people are leaving, the gaps in these responses may suggest issues that need to be addressed. Factor 1: Teamwork, Supervision and Leadership. According to the Partnership, their analysis of Federal Employee Viewpoint Survey data “shows that federal employees especially value a cooperative work environment. Employees look for direction from their leaders – for clarity in how their work and work unit realities and contributes to accomplishing the organization’s goals”. Factor 4: Performance Management, Compensation, Benefits and Work/Life. The last element of the framework was described as “Performance management encompasses setting performance standards and expectations for job functions, evaluating employees’ performance and accomplishments against those standards; providing feedback including developmental support; determining when individuals have demonstrated the capacity to be promoted; and recognizing and celebrating accomplishments, teamwork and results. New generations of employees have demands for new career paths, different management styles, different workplace flexibilities, a learning environment and different means of recognition. They also are less willing to wait their turn for promotion, prompting a call for new patterns and means of communication between supervisors and employees”. In a companion report by the Partnership entitled Keeping Talent: Strategies for Retaining Valued Federal Employees suggested using this framework to analyze employee responses to questions related to the factors above. In doing so, the results could help managers determine where to focus their attention. 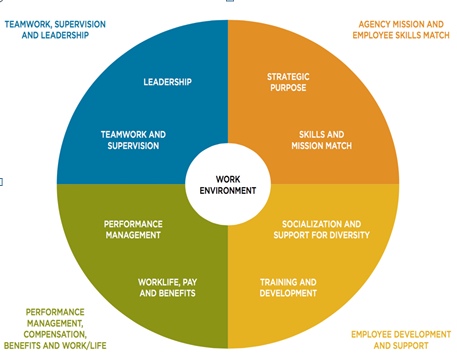 The following questions used in the federal employee survey are sorted by the four factors in the Workforce Environment Framework (see figure 3). They are examples of questions managers might analyze based on the responses of those employees who say they intend to stay or leave in the next year and why. Rank ordering those questions where the responses show the biggest gaps between those who say they plan to stay versus those who say they plan to leave can help agency officials decide where they might place priority to address retention concerns. Managers tend to feel the pain of attrition the most. Showing them how data might help to identify systemic problems can take it from a case-by-case look at a problem to understanding whether there are structural or organization-wide behavioral issues that need their attention. Judy England-Joseph is a Strategic Advisor and former Director of Research with the Partnership for Public Service; an employee engagement consultant with CPSHR and an Adjunct Professor at the Schar School of Policy and Government, George Mason University. She was formerly a senior executive with the U.S. Government Accountability Office and now teaches in its Center for Audit Excellence. Roger D. Sommer, “Retaining Intellectual Capital in the 21st Century”, SHRM White Paper, 2000.